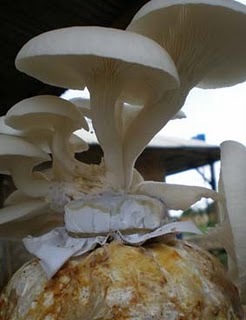 Protein content of oyster mushrooms on average 3.5 to 4% of wet weight. Means that the protein two-fold higher than the asparagus and cabbage. When calculated on the dry weight of oyster mushroom protein content is 19-35%, while rice 7.3%, wheat 13.2%, 39.1% soy and cow milk 25.2%. Oyster mushrooms also contain nine essential amino acids that can not be synthesized in the body of lysine, methionine, tryptophan, threonin, valine, leucine, isoleucine, histidine and phenylalanine. The fungus is also a good source of minerals, the main mineral content of the highest is potassium (K) and phosphorus (P), sodium (Na), calcium (Ca) and magnesium (Mg). However, the fungus is also a good source of minor minerals because they contain zinc, iron, manganese, molybdenum, cadmium, and copper. Concentrations of K, P, Na, Ca and Mg reach 56-70 percent of the total ash, with very high potassium content reaches 45 percent. This principle is easy oyster mushrooms cooked into various kinds of dishes, from stir-fry, salad, tempura, soup until other, more complex dishes. Still hesitant to consume this oyster mushrooms?